Barb Turner had the good fortune to play on championship teams in three consecutive seasons. In 2002, the two-time high school All-American from Cleveland led East Tech (25-1) to the state Division II championship by scoring 30 points and grabbing nine rebounds in a 53-45 victory over Columbus Mifflin. As a freshman at the University of Connecticut in 2003, she averaged 9.5 points in six tournament games while the Huskies marched to the NCAA championship. A year later she was a champion again. While Connecticut was beating Tennessee in the 2004 title game, Turner contributed 12 points and nine rebounds. The Huskies did not win the NCAA crown in Turner’s junior and senior years, but it was no fault of hers. 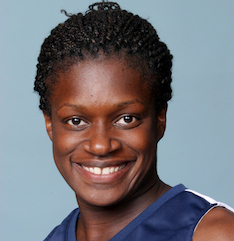 In 2005 she made the Big East All-Tournament team and in 2006 she scored 31 points against Georgia in an NCAA Regional semifinal. Turner finished with 1,629 career points, eighth all-time at UConn. Selected by Seattle in the 2006 WNBA draft, she played one season for the Storm. She played for Houston in 2007 and had a breakout season for the Connecticut Sun in 2008.